There is such an unmistakable, yet unquantifiable value to wilderness adventure. Spending time out in nature, pushing oneself physically and mentally, taking risks, venturing into the unknown. Over the years, it has become something I long for. It is a passion. And the more experiences I have on the rivers and trails and mountains and canyons of this awe inspiring earth, the more I realize how much I need them. My soul needs time in creation. My spirit needs adventure. These experiences make me a better person. They teach me lessons about life, about myself. They remind me how good it is to be alive. My best friend Casey understands this as well. For the past ten years, it has been our understanding of this shared passion that has largely made our friendship what it is. We understand each others longing, and we love sharing adventures together. After living on opposite sides of the country for the better part of a decade, Casey in Utah and myself in West Virginia, we found ourselves both back in Texas where we grew up. Over the years, we would travel across the country to meet up, doing river trips down Cataract Canyon out west, and the Gauley River back east, but often we would get to see each other only a few weeks to a month out of the year. Now, we were living in the same town again, both grateful to have ample time to hang out, but we found ourselves wondering, where is the adventure? We were living in New Braunfels, a town on the I-35 corridor between San Antonio and Austin, and though it is a beautiful place with some great people, wilderness is, without a doubt, lacking. Without realizing it, we had both become somewhat spoiled when it came to open spaces. In both Utah and West Virginia, wilderness abounds. Casey and I worked as river guides and wilderness instructors, and spent the majority of our time out in nature. Experiencing wilderness had become a part of life. So now what? Initially, I accepted to role of victim. There are no open spaces, no wilderness here, so there is nothing I can do about it. I resigned to putting that part of my life on hold. But as time passed, both Casey and I soon realized that our desire to spend time outside, our passion for wilderness, was not something we could just turn off. I began questioning myself. Why was I letting my situation in life dictate what I do with my life? If I am truly passionate about something, shouldn’t I be passionate about it everywhere? Casey and I would spend our evening hours enjoying cigars and a few beers and tossing out ideas. Then one day, it hit us. It was time for an adventure. About a month prior, Casey had heard about stand up paddling and how it was a big hit on Town Lake in Austin. He bought a few boards, and we started taking them on a flat stretch of the Comal River in downtown New Braunfels. It was great. We’d go out and paddle early in the morning, while the fog was still rising off the water, or under the glow of a full moon. The more we paddled, the more we talked about how good it is to be on the water. We reminisced about river trips of the past, down the Grand Canyon and Cataract Canyon and down the New and Gauley Rivers. For the both of us, there is nothing we love more than river trips, especially when they involve multiple days. The moment of pushing your boat into the water, disconnecting yourself form the hectic pace of the “real world,” and knowing that you have everything you need is like none other. It is the ultimate sense of freedom. For the next few days, week, or month, your world is only as wide as the river and its banks. Senses are fully engaged with the chosen few around you and the natural world abounding. 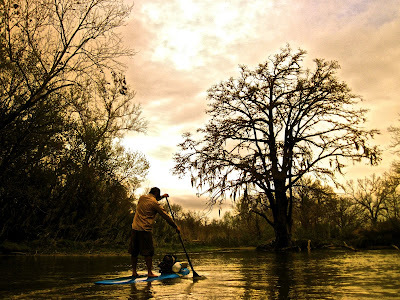 And so, naturally, after a couple weeks of paddle boarding, we both asked the question, “When’s our next river trip?” I guess instead of “When,” the real question was actually “Where?” Where could we do a multi-day river trip on stand up paddleboards? Our answer was literally just up the road. The San Marcos River flows for 83 miles, beginning at a spring in the town of San Marcos and making its way to the confluence with the Guadalupe River just outside the town of Gonzales. We began looking at maps and trying to figure out logistics. There were a few roads crossing the river in between San Marcos and Gonzales, but the majority of the land on either bank was private ranch land. This meant that access was limited, which meant the chance remoteness was increased. The next thing we had to figure out was what we would take. On most long river trips, when taking rafts, you bring a lot of everything. Unlike backpacking, weight is not an issue. There is always room for more beer. On this particular trip though, we would have to strap everything on to the front of our paddleboards. For those who have never spent time on a stand up paddleboard, simply getting comfortable with balancing oneself can take some time. The challenge of taking minimal gear intrigued the both of us. On top of that, we had no concept of how fast we would move down the river. We did not have a clue what kind of mileage we could do in a day, what the rapids would be like, or how realistic it was to stand up and paddle for eight hours a day. Unlike kayaking and rafting, if we were to move downstream, we would need to be standing. The more we thought about it, the more we realized how many unknowns there were, which in turn got us even more excited about trying. After all, it is the unknowns and the risk that make it an adventure. After a little more planning and some food and water caches being hidden under a couple bridges, the morning of our launch had arrived. My wife Laura drove us the to Sewell Park, on the campus of Texas State University in downtown San Marcos, with the idea that she would come pick us up in 4 to 6 days when we arrived downstream in Gonzales. It was time to launch, and both of us were brimming with excitement. We had longed for some adventure, and we had found it. The next three and a half days were absolutely amazing. There was the thrill of being out paddling with my best friend, not really knowing what to expect. In the research we had done prior, we found very little info on multi day stand up paddleboard trips. Nothing we could find showed signs of anyone ever attempting to run the length of the San Marcos River on one. Near the end of our third day, we passed a older man sitting in a small fishing boat still tied to the right bank. He was wearing jeans and boots, an old button down work shirt, and a cowboy hat, the typical attire for a South Texas rancher. He was enjoying a cold, evening beer, and as we approached, he nodded. “Howdy fellas. Where you boys headin’?” “Evening sir. Trying to make it to Gonzales,” we replied. “Gonzales” he repeated, “well take care, and watch out for moccasins.” An hour or so later, Casey and I had found a sandy spot on the left bank to camp for the night. Sure enough around the bend comes the rancher and his fellow old timer. They were checking fishing lines they had set up earlier. As they passed, Casey and I were given another nod, and as they puttered off with their small prop motor, we could hear the rancher telling his old pal, “See, I told ya I seen some young fellas on surf boards.” The next morning we found out why he felt the need to warn us about the water moccasins. We saw over thirty in the span of 3 hours! Still one of my favorite trips amigo. About time to plan something else.